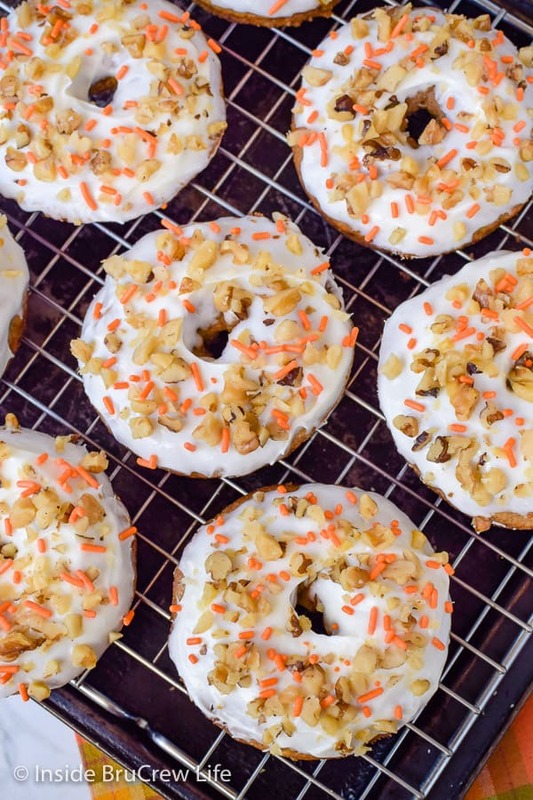 Enjoy a few of these soft baked Carrot Cake Donuts for breakfast. Cake for breakfast is always a great way to start out the day. Carrot cake is one of my favorite cakes of all time. It makes me feel like I am eating a healthy dessert because: A. there are carrots in it and B. there is pineapple in it. 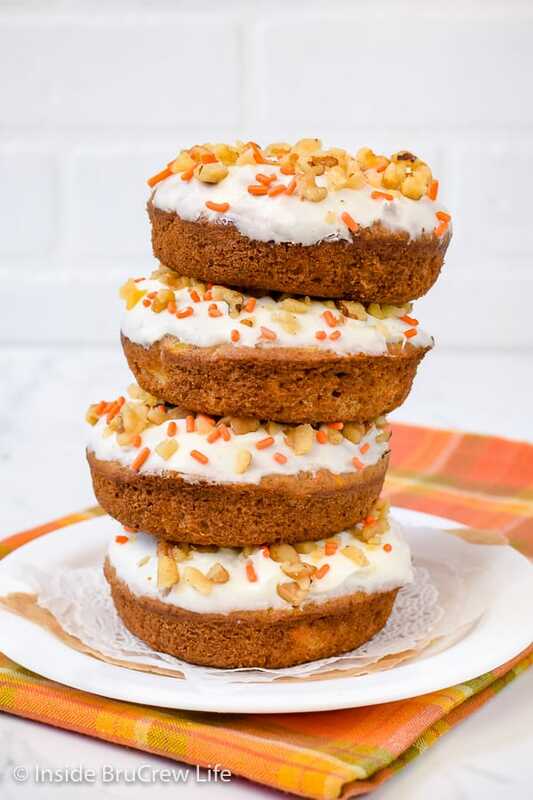 The last time I checked, carrots and pineapple were still healthy fruits and veggies, so that makes these Carrot Cake Donuts healthy, right? YAY! A yummy and healthy Easter breakfast idea is coming right up. Ok, fine. You got me. These carrot donuts that I made are n0t really healthy at all. But they do have carrots, pineapple, and yogurt in them, AND they are baked not fried so they aren’t THAT bad for you. Just go with it. Don’t burst my bubble today. I love this quote! It is now my life motto! LOL! Power to the VEGGIES!!! 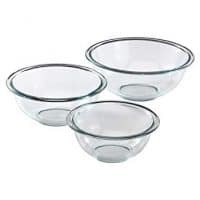 You will also need a mixer, a bowl, a donut pan, and a ziplock bag to make these easy baked donuts. Preheat the oven and spray a donut pan with nonstick spray. Beat the butter, salt, vanilla, and brown sugar until creamy. Add the yogurt, drained crushed pineapple, and shredded carrots and mix again. Do not use the already shredded carrots from the store because they do not have enough water content in them for baked goods. Freshly grated or shredded is best. Add the flour, spices, and baking powder and soda and mix in gently until everything is combined. Spoon the batter into a large ziplock baggie and cut one tip off. Make sure it is large enough that the carrots and pineapple can squeeze through too. Fill the donut pans with batter and bake for 10 minutes. Let the donuts cool in the pan for a few minutes before removing them and letting them cool completely on a wire rack. Beat together the frosting ingredients until creamy. 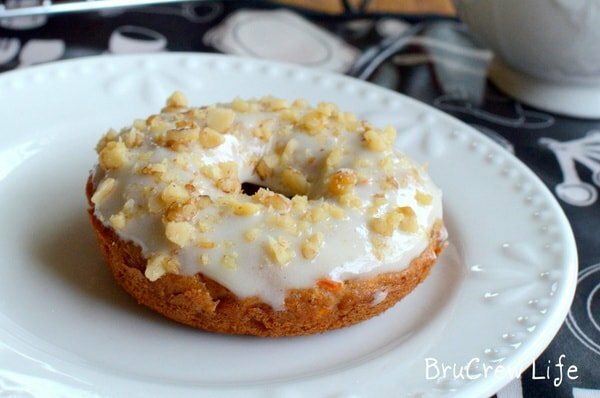 Dip the tops of the Carrot Cake Donuts in the cream cheese glaze and sprinkle with chopped walnuts and orange sprinkles. 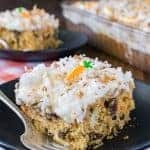 Coconut, pineapple, raisins, and carrots make this Loaded Carrot Cake the best Easter dessert! 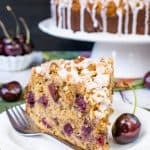 Add a pan of this easy cake to your holiday plans! 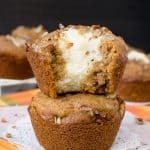 These sweet Carrot Cheesecake Muffins are soft and delicious and will make you think you are eating carrot cake for breakfast. This sweet Carrot Coconut Bread is loaded with veggies making it acceptable to eat “carrot cake” for breakfast. 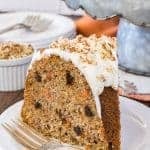 This spiced Carrot Bundt Cake is loaded with carrots, nuts, and raisins. It is a soft, dense cake that is great for Easter parties or dinners. Preheat the oven to 375 degrees and spray a donut pan with nonstick spray. Beat the butter, sugar, vanilla, and salt until creamy. Add the egg, yogurt, pineapple, and carrots and beat again. Add the flour, cinnamon, nutmeg, baking soda and baking powder and slowly mix it in. Fill a large ziplock bag with the donut batter and cut one corner off. Squeeze into donut pan cavities filling 1/2 full. Bake for 10 minutes. Cool a few minutes in the pan and remove to wire rack to cool completely. Beat the cream cheese, butter and pineapple juice. Slowly add the powdered sugar and beat until smooth. Dip the cooled donuts in frosting and sprinkle with chopped walnuts and sprinkles. 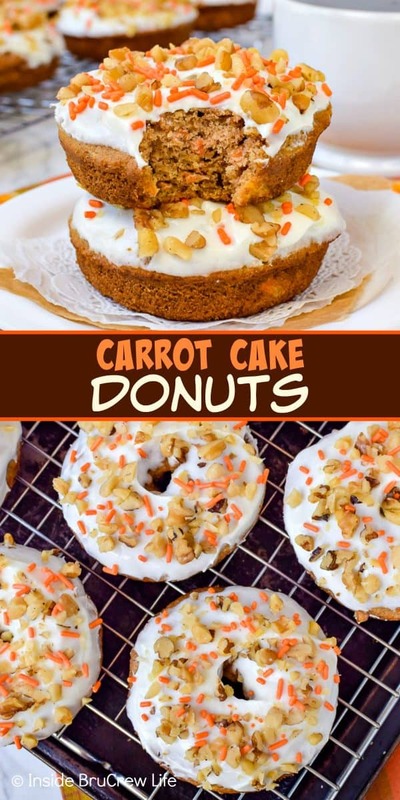 *The post for these Carrot Cake Donuts was first published on January 29, 2012. The photos were updated and the post was republished April 12, 2019. I made them this morning, they are awesome! 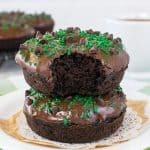 I love all these donut recipes as I have a donut pan which I love. 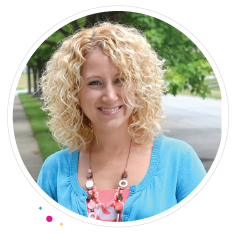 I also like your new blog design and that the recipes are so easily found. Now if only you had a print option ~ or am I missing it somewhere? 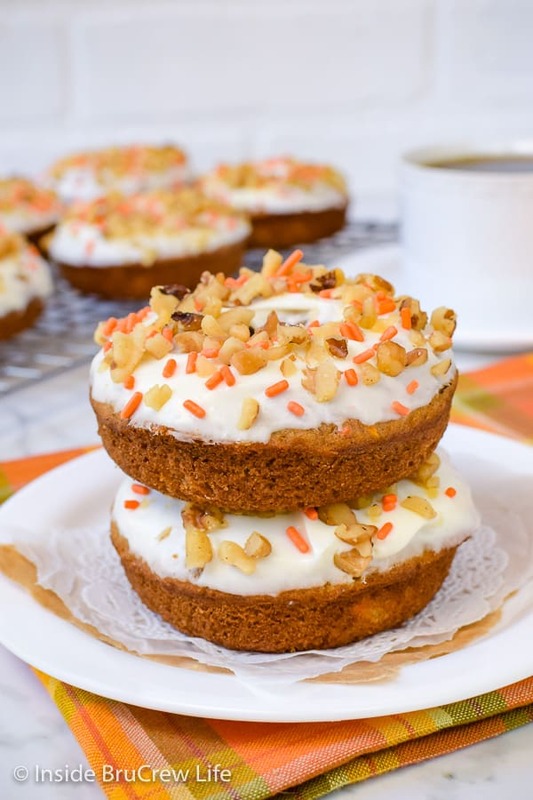 This is so funny, carrot cake donuts were on my “list to make.” LOVE IT!!! And duh, total health food. Shut UP! These sounds so good! Carrot cake is my all time favorite cake (for the same reasons as yours!). Definitely pinning these! Thanks, Jocelyn! LOL – Love that quote too. These look delicious. Pinned them and added them to my “to bake” list. I need a donut pan asap! I was going to make carrot acke cupcakes for Nathaniel’s 4th Birthday on Thirsday but I think I will make these!! PLEASE link up to my SLEEPY SUNDAY linky party!! Came across your post at Mingle Monday and I pinned this recipe immediately! Absolutely love it, can’t wait to try these out! I do like a good tasty slice of carrot cake every now and then. I also have a weakness for donuts. Based on that, it looks like you have pulled together something that I would definitely enjoy. Very unique and delicious creation here. Thanks for sharing this one-definitely a winner. Yummy and so good for you too! Oh my, I think I have died and gone to heaven! Oh yum! Carrot cake is so good, dessert for breakfast? I’m in! I found this on pinterest but forgot to pin it! Thank you so much for posting the recipe! Oh my goodness these look amazing!!! 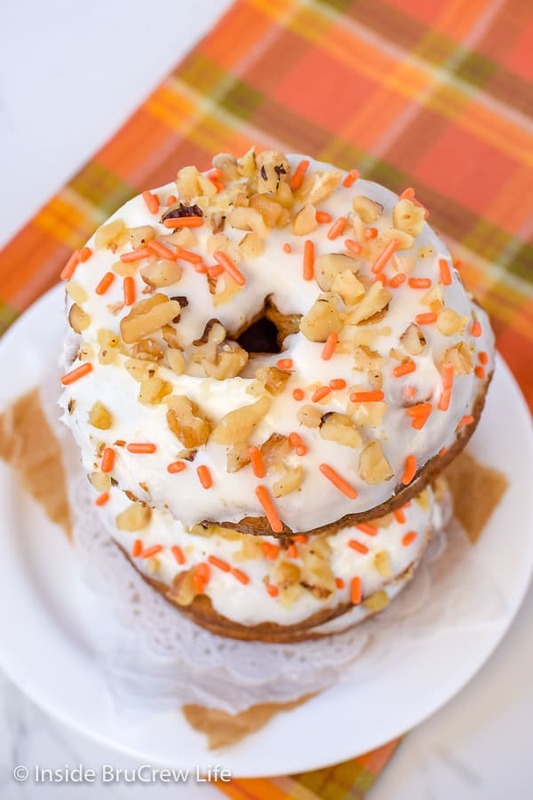 I love carrot cake more than anything so to have it in donut form… Oh my I’m speechless! love the new look! and seriously, my favorite cake in donut form! It couldn’t get any better! Any dessert with fruits and veggies is automatically healthy, right? That means you can eat double what you normally would! YUM! This looks so yummy. My family would love them. Come visit. We have a wonderful molten cocoa cake and a fat free sweet potato souffle. Just came over from Mandy’s Recipe Box. Excuse me, while I salivate all over your blog. :) These look to die for! I’m crazy for anything carrot cake related. I’m so thankful that gaining weight doesn’t happen by looking at pictures,because if it did, I’d be 10 pounds heavier! Thanks for sharing. Glad I found you! I love your recipe! These donuts sound delicious! Would you come over to Cast Party Wednesday and share it? Absolutely a must-make for me! Best of both worlds for sure! Pinning and featuring on my FB page today! Just wanted to let you know I made your Carrot Cake Donuts and they were devoured within 10 minutes at work! Thanks for the great recipe, I included my link if you wanted to check them out! 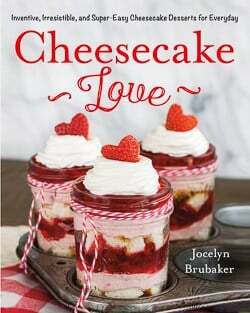 Looks delish, Jocelyn! I love your vegetables quote… I’d definitely get my veggie intake that way! 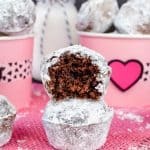 What a fun recipe; I love that you used carrot cake to make donuts! That is awesome! 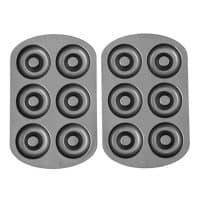 Do you have a donut baking pan that you make them in? Thanks, Mackenzie. Yes, I have two different sized donut pans that I bought at Michaels. I featured this as on of my favorite pins this week. Love carrot cake anyrpthing, but donuts would be great. Hope you can drop by and take a look. Thanks for sharing. We have a party on Mondays – What’d You Do This Weekend. Love for you to bring something over then. Are these best the same day they are made? I would like to make them the night before to bring to work. They look so amazing!! Could I leave out the pineapple? my family doesn’t like pineapple in carrot cake. Thanks! You can definitely leave the pineapple out, but I think you are going to need another liquid in place of it. I would try adding 1/3 cup buttermilk instead and see how that works. These donuts were downright delicious! I’m going to share this link with my followers because they absolutely have to try these! Thanks for sharing! 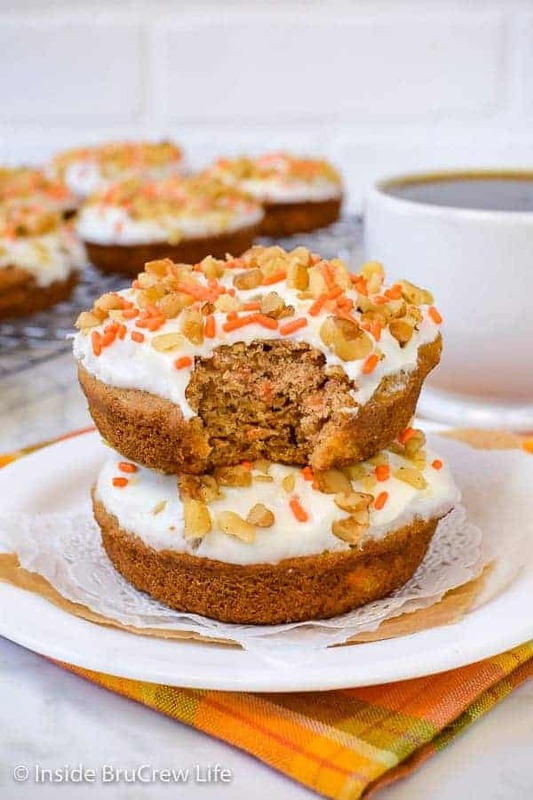 Ok, carrot cake as a donut?! Yes, please! These would be gone so fast with my family! What a decadent treat! These would be perfect for breakfast, brunch or dessert! They look delicious! These look so good! Can’t wait to make these for Easter! So cute for easter! I always need a reason to pull out my mini doughnut maker!